Hypertrophic Osteodystrophy (HOD) is a canine autoinflammatory disease affecting young rapidly growing large breed dogs between eight weeks to eight months of age. Affected dogs exhibit swelling and pain in their legs with reluctance to stand or walk. In addition to orthopedic pain, there are variable systemic signs of which some or all may be present during an HOD episode. Systemic signs include fever, lethargy, depression, and loss of appetite. A diagnosis of HOD is founded on radiographic evidence of bone involvement concurrent with hyperthermia and pain, and by ruling out infectious causes of the clinical signs. The cause of the disease is unknown and current treatments are focused on controlling the fever, alleviating the pain and treating the specific systemic signs present. Prognosis for severe cases is poor due to relapsing episodes and the low quality of life for the affected puppies that sometimes result in euthanasia. Currently, dog breeders have no means of selecting against HOD. Several breeds of dogs, including the Weimaraner are at high risk for developing HOD. Therefore, an inherited component is highly probable. Entire litters of Weimaraners, as well as closely related individuals, were found to be affected, also suggesting a strong genetic effect in the breed. An average of two new cases per month are reported to Dr. Noa Safra (which she is certain is only the tip of the iceberg) and demonstrates that HOD is a prevalent and an on‐going problem in Weimaraners. A research study with the goal of identifying the genetic basis for HOD is ongoing at the University of Davis, California, led by Dr. Noa Safra. Owners, breeders and treating veterinarians of affected Weimaraner puppies are encouraged to contact Dr. Safra: nsafra@ucdavis.edu; 530‐752‐1317 in to order to participate in this important study. The Weimaraner Foundation Fund (WFF) will assist in defraying the cost associated with submitting sample radiographs and blood samples. By identifying the chromosomal regions associated with HOD, we hope to assist breeders in selecting against this disease. Selective breeding will reduce the number of HOD affected puppies in the general population and perhaps save puppies and owners from the devastating outcome of euthanasia. Diagnosis of HOD is only conclusive upon acquiring radiographs of (at minimum) the Capri joints (two views are occasionally required for definitive diagnosis). Figure 1 (to the left) shows the typical bone lesions seen with HOD. 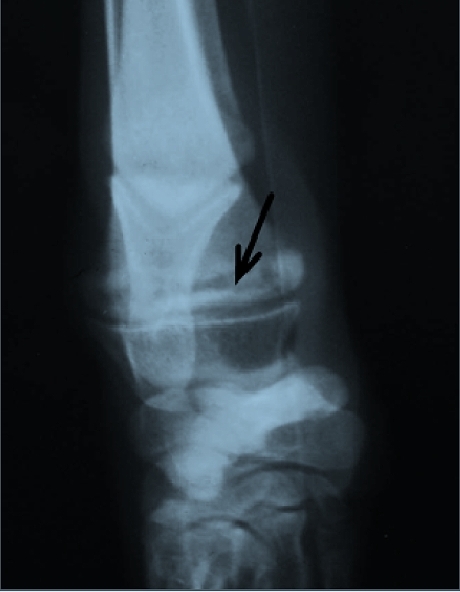 Figure 1: Mediolateral view of distal radius and carpal joint of an HOD case. Irregular radiolucent line (arrow) in the metaphysis separated from the physis by a radio‐opaque band. A radiodense zone is visible between the radiolucent band and the growth plate. The treatment is comprised of an immunosuppressive dose of prednisone, accompanied by a course of antibiotics. A good outcome requires early initiation of treatment. Improvement should be observed during the first 48 hrs (but most cases respond within 12 hours) with prompt treatment. If at any time during the treatment there is deterioration, the previous higher dose should be given. The minimal therapeutic dose should be determined by trial and error. Some cases require higher doses for longer periods of time. Other cases may require 5mg of prednisone every other day or every two days until they reach 11‐12 months of age. About 50% of Weimaraner HOD cases will respond to a conventional treatment with NSAIDs and pain‐medication; however, it is currently not possible to predict which cases may respond to NSAIDs, demonstrating positive response to treatment (reduced fever, return of appetite and mobility) within 48–72 hours.